Originally published Jan 2017; updated with even more awesomeness July 2018. I’m going to show you how to save time and money when it comes to your blog. Truth is, you don’t have to come up with a brand new “from scratch” blog post every time. Nor do you have to have separate strategies for blogging, your newsletter, and social media. You can have one smooth and super-efficient process for all of your content. I want to help you get the absolute MOST out of Every. Single. Blog. Post. Because creating that first awesome piece of content involved a lot of your time and/or money, so let’s make sure it goes as far as possible! 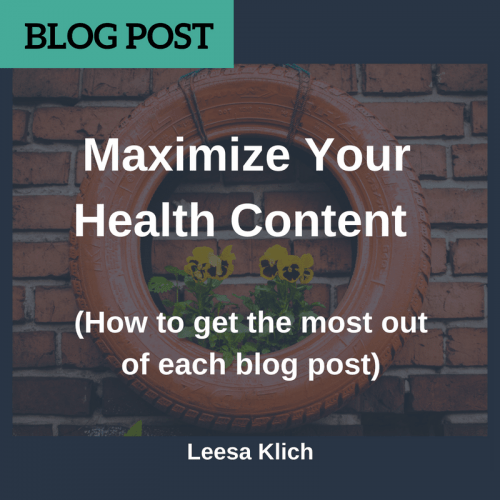 Let’s maximize your health content! The tips and strategies in this post help you save time because you’re not starting from scratch. When you have a well-researched well-formatted well-written post to start with, it’s a great foundation for a new piece of content. Things can move much quicker when you already have something great to start with. By maximizing your content and getting more out of each blog post will also help you to come across as an expert in your field, and ensure you have a consistent message when you reach your ideal clients. By sticking with blog post topics that relate directly to your area of expertise you become known as an expert. Not only to your blog readers, newsletter subscribers, and your social media followers – also to search engines! Plus, your audience has various different ways of looking at your content and they may have different preferences when it comes to consuming your content. You can literally reach more people by doing less work! This post will show you how to use one piece of content to create lots more content. Of course, you’re already going to include each post in your newsletter, and share it on social media. That’s a given. A way to engage your audience. The reason why I personally love making great posts even better, is because it will help you to rank that post in search engines. In terms of SEO, it is better to have one “epic” post, rather than 4 similar ones with the same keyword or topic. With good content, not filler BS wording, of course. 1 – Add internal links. Make sure that every piece of content links to related posts on your website. Make sure those links are genuinely relevant and add value to the post. Don’t just link for the sake of linking. 2 – Use your SEO plugin or another tool to optimize the post for a keyword so it can rank higher in search engines. Here’s a complete list of simple SEO tips so you can make that happen. 3 – Add a recommended recipe, supplement, or fitness routine that would complement the content and help your audience even further. 4 – Film a quick video explaining one element of, or outlining the highlights of the post. You can upload this video to your YouTube channel and embed it like I did in this post on melatonin. 5 – Make sure you have an opt-in box at the end (and another in the middle) of your post, so anyone who loves it can sign up to your email list. 6 – Create a content upgrade. This is something related directly to the post, and is an “upgrade.” You can include it as a downloadable bonus “opt-in freebie/lead magnet.” In order for your audience to get that upgrade, they will sign up via email, and you add them to your list. 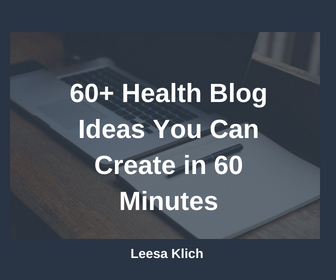 The reason why I love content upgrades and use them in this post on 60+ wellness blog ideas you can create in 60 minutes, for example, is because it adds even more value. It’s the ability to quickly download the entire list of wellness blog ideas instantly. Someone might be in a rush, or want a “hard copy” to keep. Maybe they don’t have time to read the whole post and just want a simple checklist. Create a pdf, whitepaper or guide and have it available for instant download. It can be a summary or extra “bonus” information. Read the post and create an mp3 for your audience who prefers (or only has time) to listen. Pull out the facts, stats, quotes, or recipe and put them into a nicely-designed infographic with some great images. Create a checklist or “quick tips” that goes along with the post, to help your audience implement your awesome information as quickly as they can. Create a worksheet that someone can use to go through the steps outlined in your post and help them document where they are each step of the way. Regular, relevant, valuable content is what your online business needs in order to help your audience know, like and trust you. Most people need several contacts with you before they’ll buy anything from you. Some say this magic number is 7 and call this the “rule of 7”. Having regular high-quality content helps you to establish yourself as an expert, and also helps you to build a relationship with your audience. 7 – Create an mp3 audio file of you reading or discussing your post, (or rip the audio from a video) and use it as a podcast episode (separately from the content upgrade). 8 – Create a slideshow of your content. You can take this one step further by creating a video of you presenting your slides. This can then be embedded in the original post, become a separate vlog post, or even a module in a course you’re creating. 9 – If you’re open to Q&As use the content in the post and host a webinar (now called a “masterclass”), or even a live video. 10 – Republish the post on Medium and/or LinkedIn. This is called “syndication” when you publish the same thing on different platforms. It will help you to reach new audiences and share your awesome content with even more people. Pro Tip: When I publish my posts on Medium, like I did with this post on turmeric vs curcumin. Don’t forget to use their Migration and/or Import tools to include a “canonical” like to make sure search engines know which one is the original. 11 – How about expanding on one area. Many longer posts would have several sub-sections in them, and each section can turn into a post of its own. You can add new, relevant information, different examples, personal stories, or case studies to beef it up into a quality standalone post. Oh, and don’t forget to link each of the “sectional” posts to the main post (see #1 above). And if you really do this well, you can use the series of posts to create a blog series, separate guide, ebook, or course (which you can also use as a content upgrade or even a standalone product – see #6 & #8 above). 12 – Interview a colleague, expert, or thought leader in this area and create fresh new content on the same topic. 13 – Use the information in your post to write a completely unique post and offer it as a “guest post” on other blogs who reach your target audience. 14 – Add a question or two for your audience at the end of the post and ask them to respond in the comments, or even email you personally. You can use these questions as ideas for brand new posts where you answer the questions. 15 – You could have a separate “giveaway” or “contest” for a product or service related to your post. 16 – What about creating a challenge or quiz for your audience using the same information from your original post. 17 – You can create a survey or poll of your audience related to that topic. Even sharing the survey/poll results can become its own separate piece of content. Go back through your old posts and do the same thing to create new, fresh and updated content. Include more value. Make them more appealing to your target audience. Perhaps there is new research, industry news, or examples you can add? As you can see, investing substantial time and/or money into a great piece of content can take you much further than just that single post. Which of these ideas on how to maximize health content you like the best (or dislike the most), and why… Did I miss any great ideas? Thanks, your post gave me a different outlook on my content and how to get maximum use out of it. That’s great Anthony, I hope Medium works well for you! Thank You so much for this post. There are so many ways to convert a one or two page post and get an abundance of amazing content. It truly becomes more personalized and brand appeal.